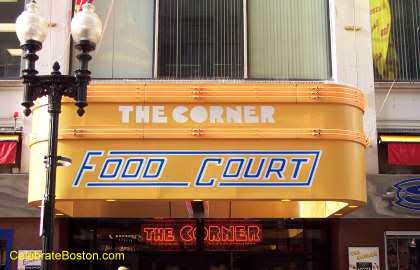 The Corner Mall is located at Downtown Crossing. This retail collective is not like a super large conventional mall in the suburbs, but can be described as Downtown Crossing's Food Court. The mall has storefronts facing Washington and Winter Streets, in a renovated old office building. The main entrance opens to a multi-level corridor which leads to a relatively large food court for a downtown area. The Corner Mall is bustling and crowded at lunch time, but that is because there is a decent selection of fast food establishments in the food court. The mall has additional seating in the basement, with public restrooms. Some of the restaurants in the food court (collective seating) include: Wong's, Cafe Calypso, Subway, Subway, McDonalds, Sakkio Japan, Bourbon Street Cafe, Thai Accent, Sbarro, and Dunkin Donuts. Across Washington Street is the historic 426 Washington Street retail building. The Filene's Basement store was originally located in the basement of this landmark. Walking Directions: Exit the station, and you are at Downtown Crossing. The Corner Mall has entrances on Washington and Winter Streets, with large yellow canopies above them. From Park Street Station on the Green & Red Lines, walk one block east down Winter Street to Downtown Crossing.